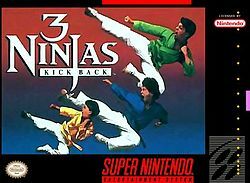 Based on the movie, 3 Ninjas Kick Back for Super Nintendo allows you to play as one of the three teenage martial arts experts Rocky, Colt, or Tum Tum as you battle an army of ninjas, wild animals, and the evil Koga in order to rescue Grandfather Mori (your sensei), as well as his magical dagger. Play solo or along with a friend in the Two-Player mode as you embark on the journey. 3 Ninjas Kick Back also includes many secret areas and rooms that may offer great rewards.